For pool heating, covers and filtration systems, we are the experts. When it comes to swimming pools, spas & Jacuzzis, we have the experience and expertise to provide for all your requirements. Whether it’s water filtration, pool heating, pool covers or dehumidification for indoor pools, we have many years experience in this field. We have contracts to carry out essential maintenance work for heat pumps and filtration systems for some of the largest private swimming pools in some of the finest villas in areas like Marbella, Sotogrande and Estepona. However, we are just as happy to tend to smaller requirements in other areas of southern Andalucia. Andalucia has a great climate for heating both outdoor and indoor swimming pools. Our relatively warm outdoor temperatures make the use of heat pumps extremely efficient and the "go to" option for pool heating. With so many months of sunshine and good outdoor temperatures, it is possible to swim for many months of the year without needing to spend a fortune on pool heating. In general, the summer months require no extra heating. However, we have good outdoor temperatures during the spring and autumn months for swimming and with only a small amount of additional heating, the pool is very comfortable to swim in. 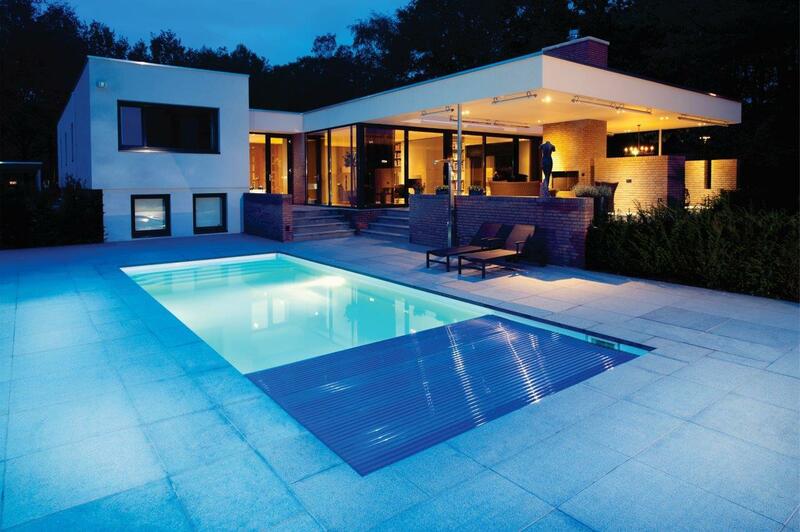 So what are the most economical and energy efficient ways to heat a pool? Heat pumps are one of the most efficient and economical ways of heating a pool, especially in a moderate climate like that of southern Spain. Although there are different kinds of heat pumps, the basic premise behind them is that they don’t directly burn fossil fuel to create heat. Rather, they use a small amount of energy to transfer heat from one source to another. ‘Air-Source Heat Pumps’, the most common form of heat pump in a moderate climate like that of Andalucia, extract the heat out of the air and compresses it to a higher temperature to be then transferred to the area that requires heating (your home, swimming pool etc). The higher the temperature of the outdoor air, the less energy is required for this process. However, it is essential that the right type of heat pump is chosen and installed in the best possible way to ensure you get maximum energy efficiency out of your system. We have extensive knowledge of the range of heat pumps on the market, covering brands such as AquaCal, Heat Siphon, Air Energy & Zodiac. Solar collectors (panels) are a very effective way of heating your outdoor pool during those months when it’s warm outside but not hot enough to heat the pool. A solar heating system can be used in isolation or as a supplement to another heating system, whether that be a heat pump or an oil/gas burning system. If you’re starting from scratch, and you’re just looking to extend your swimming, then a solar system is a great option. Likewise, if you have an existing non-solar heating system, and you’re looking to reduce your on-going bills, then solar is highly recommended. We work with a range of different brands/models of solar collector systems including Viessmann, Salvador Escoda, Sonnenkraft, Saunier Duval, and prices vary accordingly. Obviously different systems are more effective (and therefore usually more expensive) than others. We would provide you with two or three different options depending on your budget and your requirements. Heating systems dependent on burning oil or gas are highly inefficient and expensive to run. Therefore, we would never recommend installing such an option. However, we have many years experience in carrying out repairs on such systems. Being big promoters of energy efficiency, we would always recommend either changing or modifying a system so that you either replace it with a heat pump or solar system or a combination of the two. Any efficient swimming pool heating solution, whether it’s outside or indoor, must include a pool cover to reduce heat loss via the surface area of the pool. Not only can they make huge savings on energy consumption, by retaining heat, but they generally help towards keeping the pool clean. In fact some covers serve to create a safer environment for children and pets. We have extensive knowledge of all types of covers, including automatic slatted pool covers, solar bubble pool covers, vinyl covers, winter debris pool covers… and all accessories relating to them. We deal with the best brands of the industry, so whatever your requirement, we can advise and provide accordingly. Bubble covers (also known as ‘Solar Covers’) are one of the lowest cost covers that you can get for your pool. They can provide an effective help to insulating your pool, retaining heat and reducing evaporation. 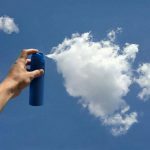 Evaporation is a big contributor to heat loss. We can measure and fit these covers to fit your pool, and install the cover with a roller to facilitate easy winding/unwinding along with easy protective storage. The roller is of course optional but highly recommended, to make the cover easier to use. Winter pool covers are generally made in two different ways. There are ‘mesh’ covers and ‘solid winter covers’. “Mesh” covers are suitable for areas prone to snow, these covers are porous, allowing rainwater to enter the pool whilst preventing leaves and other other debris from entering. Mesh covers are more suitable for areas that are prone to snow. Solid covers are made of thick vinyl and prevent anything from entering the pool. They are very effective at keeping your pool clean and clear, whilst also preventing sunlight from reaching the water, and therefore hindering the growth of algae. There are different solutions for dealing with excess rainwater. A cover with a mesh filter in the middle allows the water to drain away whilst filtering out dirt and debris. The other option is to install an electric pump that pumps excess water off the cover. Salt-water electrolysis system plus UV radiation, with integrated pH / ORP controller, in Nueva Andalucía. Essentially there are three different types of filter used in filtration systems, which are ‘sand’, ‘cartridge’ and ‘DE’ (Diatomaceous Earth). Choosing the right system is difficult and yet important because they each have their benefits, but they also differ in terms of the investment up front and the level of maintenance required. Sand filters are probably the most commonly used, the least expensive but probably the least effective. They just need to be cleaned on a regular basis by a process of ‘backwashing’. Cartridge filters are another popular choice. They are simple and effective, with the basic premise being that the filtering material in the cartridges simply cleans the water before allowing it to return to the pool. DE (Diatomaceous Earth) is the most effective of all the filters. If you want your pool water to be crystal clear and perfectly clean, then this is the filter for you. They are of course more expensive but guarantee the best results. We can advise, supply, install and maintain all types of filtering units and accessories depending on your budget and requirements. If you have an indoor pool, then a good dehumidification system is essential. 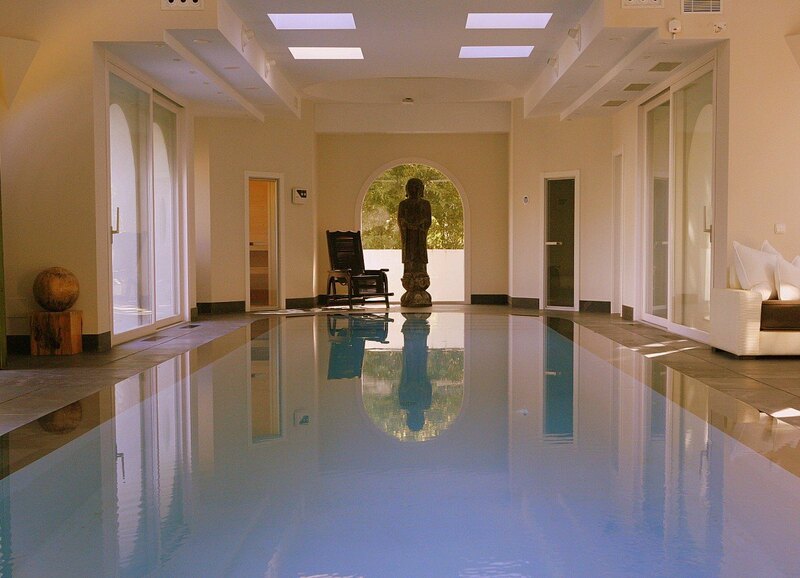 Indoor pools that are heated up to comfortable swimming temperatures release vast amounts of moisture into the air. With many years experience in this area, we can address whatever challenge you may have with respect to the dehumidification of your pool room. The most important thing is to get it right in the first place, so that expensive modifications are not needed further down the line. 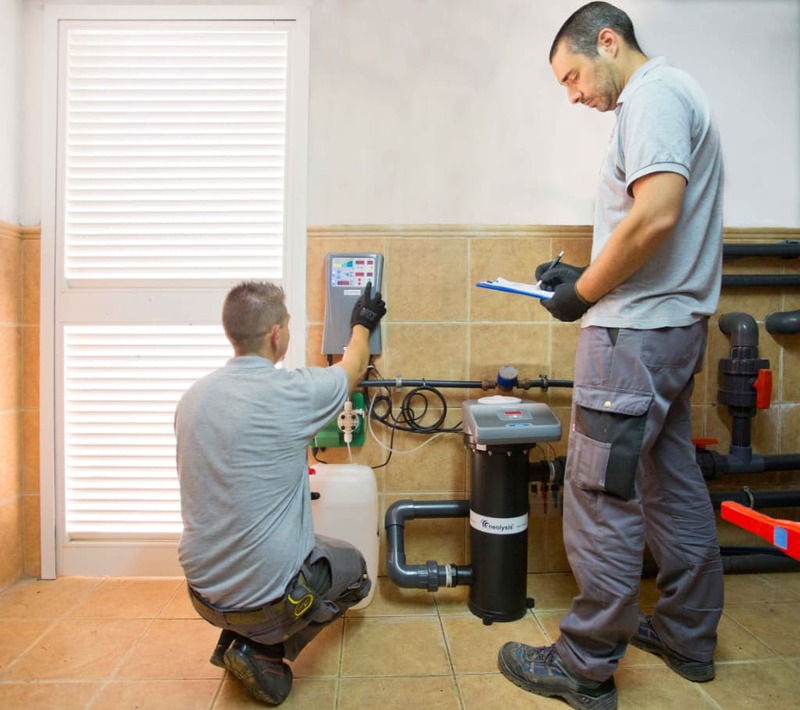 From full scale commercial installations to small domestic repairs and on-going maintenance, we have many years experience of all types of plumbing in southern Andalucia. As with all our services, we are fully authorised by the Ministry of Industry in this regard. We undertake all sorts of plumbing jobs, from full fix plumbing in residential & commercial premises, including bathrooms and kitchens, to complex machine rooms where we combine installations of solar, heat pumps and boilers to maximise energy efficiency. Also, we carry out installations of pressure boost and circulation pumps for all types of use.